The weather station project has been struggling for part of September with a random exception in my code. The source of the exception was finally identified although the exact cause is still a mystery. As a temporary measure, the component and the associated source code were removed from the project, this allowed the project to continue. In the previous post, Define a Minimum Viable Product and Ship it, I discussed a replacement for the clock module. 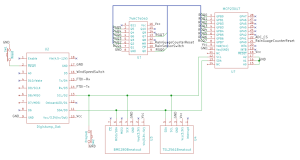 This module was changed from the DS3234 to the DS3231 freeing up four additional pins (the DS3231 is an I2C peripheral and the DS3234 uses SPI). This change seems to have introduced some instability into the system. Several days debugging followed after which I was still unable to isolate the problem. The interim solution is to remove the module and use the Ticker class to trigger an interrupt. Not ideal but this will allow the rest of the software to be soak tested. The additional Ticker object fires once per minute to trigger the reading of the sensors. In addition, the interrupt will check the current time and if the hour and minute are both zero then the application will reset the pluviometer counter. As mentioned above, one Ticker object is generating an interrupt once per minute. The frequency of the interrupt is higher than will be used in the final project. One minute is more than enough time to perform the sensor readings and log this to the internet but also frequent enough to simulate a prolonged period in the field. The prototype board was also located close to the final home for the sensors. This hit a problem as the range of the WiFi network was not sufficient for the ESP8266. 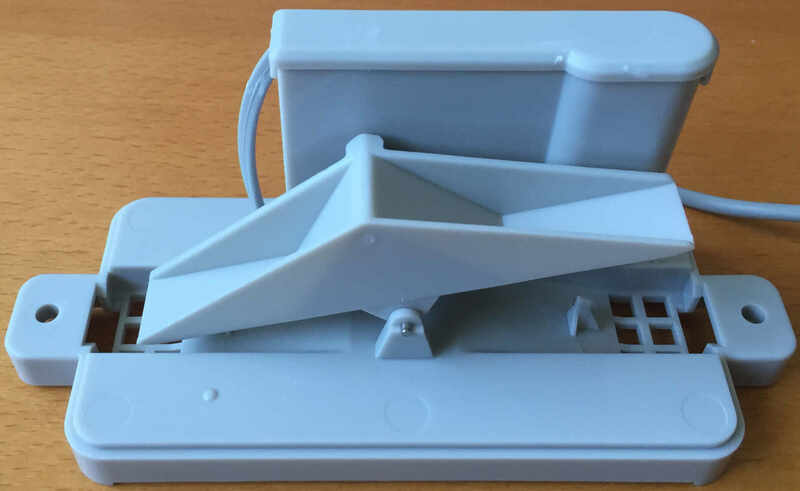 This problem has prevented the prototype to be tested in the field at the moment. The prototype board is currently sited on a window ledge in the house. taking temperature, humidity and luminosity readings once per minute. This data is logged to the Sparkfun Phant Data Service. The system has been running continuously for the last 7 days (approximately 10,000 readings). The software seems stable at the moment, the next problem, extend the range of the WiFi network. The last few weeks have seen me fighting a communication problem between the Oak and the STM8S. As a result the development has slowed down a little to the point that the project was becoming frustrating. It was about two weeks ago that I was listening to a podcast and the presenter made a very pertinent comment. Some software start-ups fail because they fail to define the minimum viable product. This gives them nothing to aim for and most importantly no firm idea of what they have to deliver. This felt very relevant as the weather station was stalling. With this in mind I decided to break the project up into a number of revisions. Although this revision is titled Basic Sensing, we will aim to get as many of the sensors working with the Oak, and only the Oak, as possible. 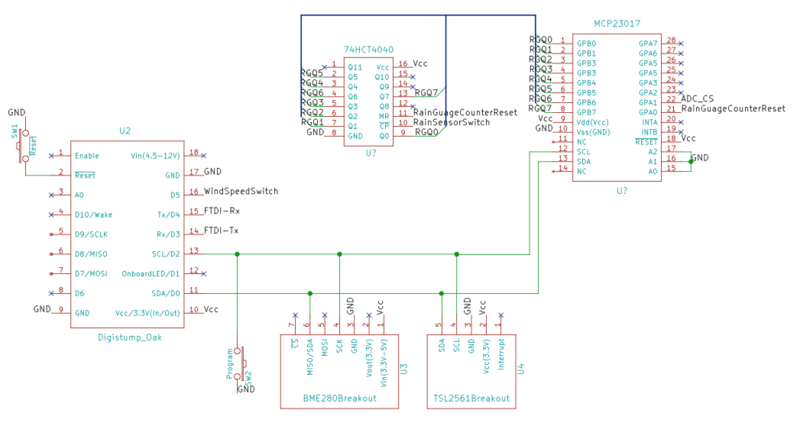 An additional pin is also required to allow the Real Time Clock (RTC) module to generate and interrupt to let the Oak know it is time to take a reading. One of the aims of the final system is to be able to run using solar power and batteries, however, for the initial version of the system this is not necessary. The main controller board can be placed inside to run on mains power with the rain and wind sensors outside. Some of the sensors would be inside so this would not give a good view of the weather but will allow testing of the software. All of the main features that make the DS3234 desirable are also present in the DS3231. 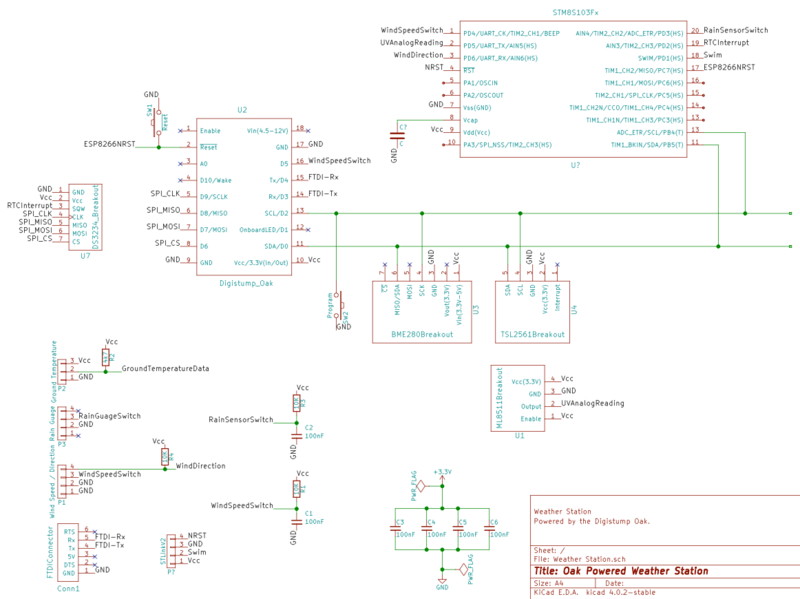 The major piece of work is the necessity to overhaul the DS3234 library created previously. The main changes to the hardware design involve moving the connections to the various sensors from the STM8S to the Oak. This has been made possible by the change in the clock module from the DS3234 (SPI) to the DS3231 (I2C). This freed up the four pins that had been dedicated to the SPI interface. These items may or may not make it onto the final board and have been added to aid debugging. STM8S code has been left in the project for the moment but this is not used in this initial working version. One of the previous versions of this application used Adafruit’s MQTT library to connect to Adafruit.IO. Recent changes to the site and to the library means that any attempt to connect the Oak to Adafruit results in an exception being thrown. A task for later is to correct this problem if possible. An Internet connection may not always be possible so it would be desirable to collect data while offline and then upload this later. This may be facilitated by the EEPROM on the DS3231 breakout board. The software is currently throwing an exception every 10-30 readings. This results in the Oak resetting itself so it does recover although there is a small gap in the data gathering. The source code has been reviewed an there are no obvious memory leaks or null references. This problem is being deferred as there is a workable solution in that the Oak does reset itself. Not satisfactory in the long term but liveable for now. The definition of a minimum product has allowed the project to proceed to the point where something can be deployed and tested. There are still a number of items to be completed before the original aims can be realised including the resolution of some issues in the minimum product. One thing I have learned along the way, don’t try and use pin 10 as an interrupt pin on the Oak as this is not implemented. The next steps, complete the initial code and deploy the external sensors. Time to move on to the next stage, protoboard. The project is already using an output expander to read the rain gauge. It might be time to think about the expansion options. To this end, the bottom right corner of the protoboard has space to experiment with a second microcontroller. It may be possible to replace the output expander and the additional ADC board with a cheaper option. Putting the project in a more permanent state is a step forward. There are still some unanswered questions such as the use of the ADC or a second microcontroller but progress is being made. A new day and a new sensor to look at, the pluviometer. A small magnet is placed on the see-saw and a reed switch is behind the fulcrum. The tipping motion triggers the reed switch each time the see-saw tips, this in turn generates a single pulse. Reading the switch becomes a seeming simple repetition of the wind speed problem, namely debouncing a switch and attaching an interrupt. One long term goal has to take this solution off grid. This will make power consumption a critical factor in the design. Attaching an interrupt does not necessarily become an attractive option as the Oak would be running continuously and with the WiFi running this would consume a fair amount of power. According to the specification for the pluviometer, a pulse will be generated for every 0.2794mm of rainfall. One possible solution to the power problem would be to put the Oak to sleep and wake it up every say 5-15 minutes to take measurements and upload them to the cloud. Doing this would reduce power but would also mean that no measurements would be take during the sleep period if interrupts were used. A cheap solution in terms of cost is to use the 74HC4040 counter. This could be put into a circuit and kept active while the Oak is sleeping. 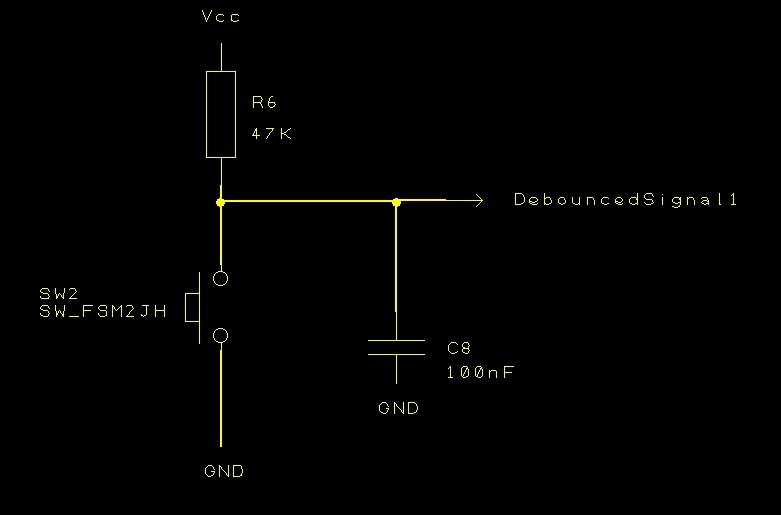 The output from the debounced switch would then be used as a clock signal for the 74HC4040. This would allow the pulses from the pluviometer to be counted while the Oak is sleeping. The downside is that eight pins are needed to read the output from the counter. With only a small number of pins, many of which have already been used, this will require some way of adding extra pins to the system. Fortunately there are a number of digital IO expanders on the market. A common series of chips is the MCP23x17 chips. These add an additional 16 inputs/output pins with communication to the chip vis I2C (X=0) or SPI (X=S). The I2S variation will fit the bill nicely. One consideration will be the amount of rainfall the system can detect before it resets to zero. Which gives 4096 counts. However, for simplicity we will only consider the lower 8 bits, i.e. 0-255 counts. The system can always be expanded later should this be necessary (or if the system has the capacity). Giving a maximum rainfall count of 71.247 mm per counting period. It is envisaged that the counting period would be somewhere in the region of 5-15 minutes. This would make an hourly average of 285mm assuming a steady rainfall and a 15-minute interval between counts. This should be well within expectations for UK weather. As an aside, the full 12-bits would allow for a rainfall of 1144mm per counting interval, or 4.5 metres of rain per hour. 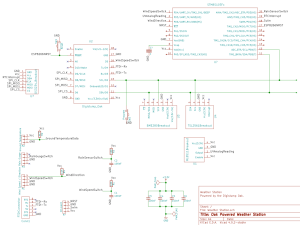 Note that the BME280 and TSL2561 are also on the schematic. The rain gauge counter bit values have been labeled RXQx, RG = Rain Gauge and Q is the standard notation for a bit in a logic design. The MCP23017 (I2C version of the IO expander) is sold by Adafruit. They have a standard Ardunio library for this component and so in the interest of code re-use, expediency and idleness this will be used. Adafruit_MCP23017 _outputExpander;      // MCP23017, I2C controlled 16-port output. //  counter to the output expander. //  Attach the rainfall counter to the output expander. 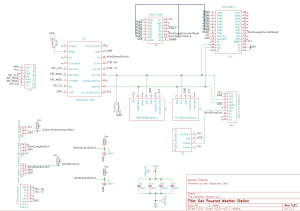 //  Attach the counter reset pin to the output expander and reset the counter. As well as setting up the pulse counter, the above code resets internal counters for rainfall today and also resets the pulse count. //  Read the counter from the Rainfall sensor then reset the count. The counter column contains the value in the 74HC4040 counter chip (lower 8 bits only). The problem occurs because the reading of the pulses is not instantaneous, the software takes longer to process the data than the counter takes to register a clock pulse and update the counter. 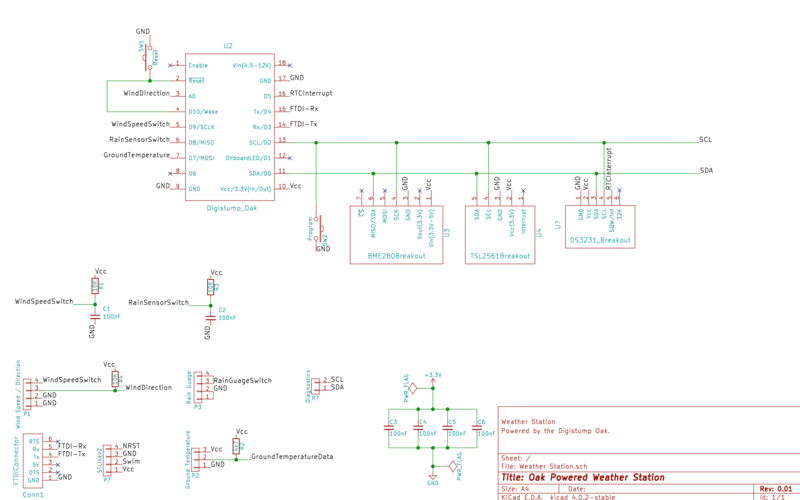 Add an AND gate between the incoming rain gauge pulse and the 74HC4040 clock pin. This can be turned off when taking a reading. 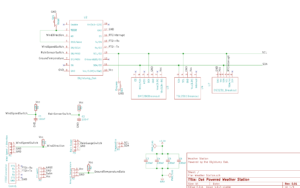 Check the documentation for the MCP23017 to see if the values can be latched and then read. Latching the values means that they cannot be changed; once latched and the values being read would be consistent. Both offer a solution to the problem and will be left as a later refinement. 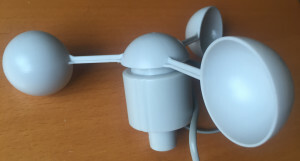 The pluviometer is a seemingly simple switch but it needs to run constantly. This presents a challenge when considering the requirement to save power where possible. 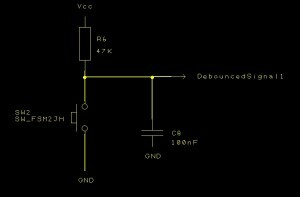 This article presented a possible solution using a small number of components bringing powered on permanently. The solution does introduce a possible error in the reading, although this should be reasonably small. A full analysis will be presented in a future article. 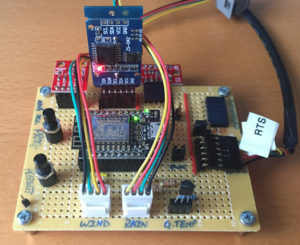 The weather station project is still at the proof of concept stage but the last few articles have run through the concepts for connecting several sensors to the Digistump Oak microcontroller. 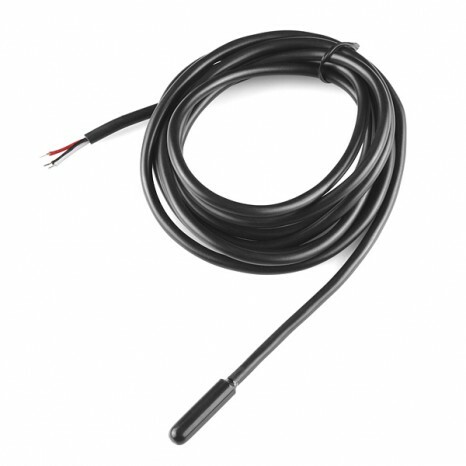 In this article we will look at the basic (and I stress basic) software required to connect the sensors discussed so far with the microcontroller and start to collect data. These sensors are currently connected to a piece of breadboard along with the Oak. Now we have the sensors connected we need to add some software goodness. Data logging to the cloud will initially be to the Sparkfun Data Service as this is a simple enough service to use. One of the first things to do is to create an account / data stream in order to permit this. The Arduino development environment can be used to program the Oak and it has the advantage that it is available across multiple environments. Digistump recommend using version 1.6.5 of the Arduino environment as there are known issues with more current versions. In previous articles it was noted that Sparkfun and Adafruit provide libraries for two of the I2C sensor boards being used (BME280 and TSL2561). An additional library is also required to support the third objective, setting the time from the Internet. The version numbers are the ones available at the time of writing. At this point the hardware should be in place and all of the necessary libraries installed. Let the coding begin. 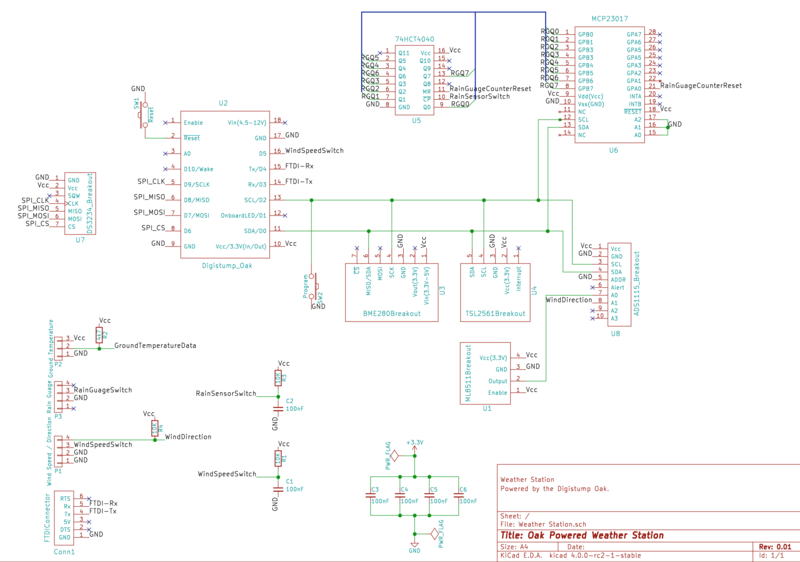 The SPI library is not going to be used in this example but will be required in future articles. //  Definitions used in the code for pins etc. //  Create a Temperature, humidity and pressure sensor. double lux;         //  Luminosity in lux. //  NTP class to provide system time. //  Wind Speed sensor, each pulse per second represents 1.492 miles per hour. //  We are logging to Phant and we need somewhere to store the client and keys. #define PHANT_PAGE          "/input/---- Your stream ID goes here ----"
#define PHANT_PRIVATE_KEY   "---- Your Private Key goes here ----"
Before we progress much further it should be acknowledged that some of the code for the BMS280 and the TSL2561 is modified from the Adafruit and Sparkfun example applications. A key point to note from the above code is the definition of the windSpeedPulseCount variable. Note the use of the volatile keyword. This tells the compiler not to optimise the use of this variable. Next up is some support code. Two methods are initially required, ftoa adds the limited ability to convert a floating point number to a char * for debugging. The second method outputs a debugging message. This has been abstracted to allow for possible network debug messages later in the project. At the moment the serial port will be used. //  Output a diagnostic message if debugging is turned on. //  Convert a float to a string for debugging. //  Convert the error from the TSL2561 into an error that a human can understand. //  Set up the luminsoity sensor. 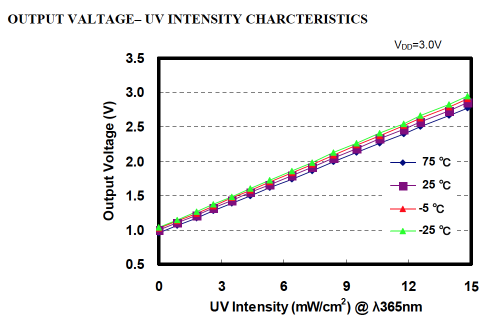 //  Read the luminosity from the TSL2561 luminosity sensor. 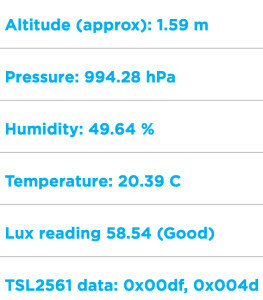 //  To calculate lux, pass all your settings and readings to the getLux() function. //  saturated (too much light). If this happens, you can reduce the integration time and/or gain. //  Log the luminosity data to the debug stream. //  Setup the Adafruit BME280 Temperature, pressure and humidity sensor. 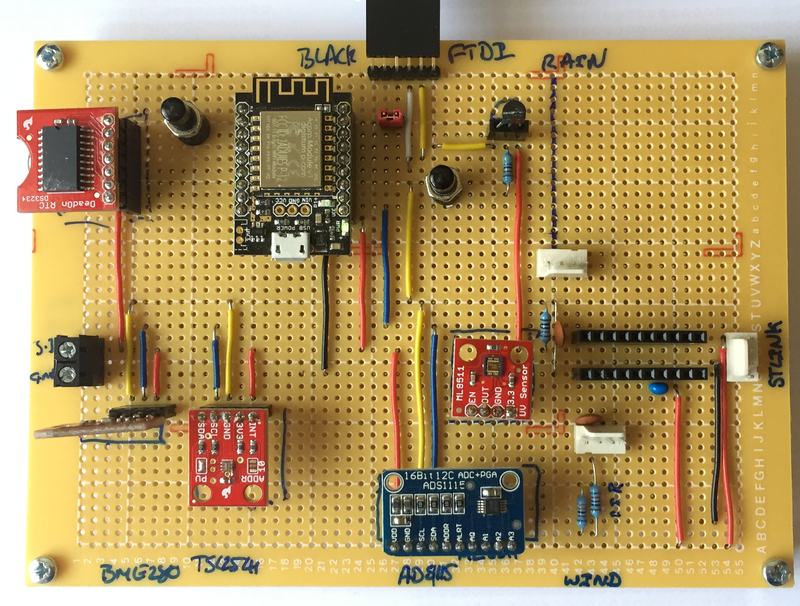 //  Log the data from the temperature, pressure and humidity sensor. //  Read the data from the Temperature, pressure and humidity sensor. This group of methods follows a similar line to the TSL2561 sensor methods, namely, setup, read and log methods. 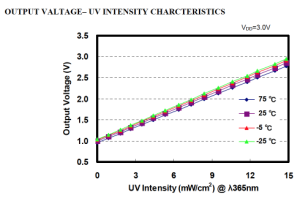 This sensor is the simplest so far as it provides a simple analog value representing the intensity of the ultraviolet light falling on the sensor. //  Read the ultraviolet light sensor. //  Log the reading from the ultraviolet light sensor. Note that this sensor does allow for an enable line. This can be used to disable the sensor and put it into a low power mode if necessary. This will not be used in the proof of concept will be considered when the project moves to the point where power supplies / solar power is considered. //  ISR to count the number of pulses from the anemometer (wind speed sensor). The non-trivial thing to remember about this code is that the method changes a global variable. The volatile keyword used in the variable definition is necessary to stop the compiler from optimising the global variable as this can have side effects. Assuming that we have a WiFi connection then we can log the data collected to the Sparkfun data service (this is based upon Phant). //  Post the data to the Sparkfun web site. //  Send the data to Phant (Sparkfun's data logging service). //  Need to put some error handling here. The stream has been set up to collect more data than is currently collected, for instance, ground temperature. Any parameter not measured at the moment is set to 0. Something to bear in mind after the project moved from proof of concept. //  Raad the sensors and publish the data. //  Read the current wind speed. This is the calculation performed in the PostDataToPhant method. The final things needed by an application developed in the Arduino environment are the setup and loop methods. So let’s start looking at the setup method. //  Connect to the WiFi. At this point the application will be either looping indefinitely until the network becomes available or we will have an IP address output to the serial port. In a more complete application this will start the logging process and periodically try to connect to the network when the network is unavailable. This is only a proof of concept after all. There is currently no Real Time Clock (RTC) attached to the system and so we need to check the network time at startup. //  Get the current date and time from a time server. This block of code loops until the network time is set correctly. At start up the year will be set to a default value of 1970, this is why the code loops until the year is something other than 1970. //  Set up the sensors and digital pins. //  Read the initial data set and publish the results. Powering up the luminosity sensor. BME280 sensor located on I2C bus. The current public data stream for this service should be viewable here. One thing to remember when comparing the above data is that the Sparkfun data stream logs data using UTC and the application above was running during British Summer Time. The code above is a proof of concept, it is not error proof nor does it take into account power usage or optimisation, it is merely meant to prove that the sensors can be read and the data output to a cloud service. All of this before even looking at the location and powering the project in the wild (OK, my garden). The current plan is for the weather station to use the Oak as the microcontroller running the show. The data from the sensors can then be uploaded to the cloud, destination to be determined, but let’s start with Sparkfun’s data service. One of the great things about working with these two sensors is the fact that there are prebuilt drivers and example code for both breakout boards available from Github. What could be simpler, well head over to the Sketch – Include Library – Board Manager… menu in the Arduino IDE and you can download the library and have the IDE install it for you. This sensor allows the radiance of the light to be calculated in a way that approximates the response of the human eye. It does this by combining the input from two photodiodes, one infra-red only and one visible light and infra-red light combined. The output from the two sensors can be used to luminous emittance in lux (lumens per square metre). As you can see from the table above, the lux values for a “normal” human day can vary dramatically. The sensor copes with this by allowing the use of a variable time window and sensitivity when taking a reading. Effectively the sensor accumulates the readings over the time window (integration interval) into a single 16-bit number which can then be used to calculate the lux reading. This sensor is produced by Bosch and is packaged in both I2C and SPI configuration on the same board. 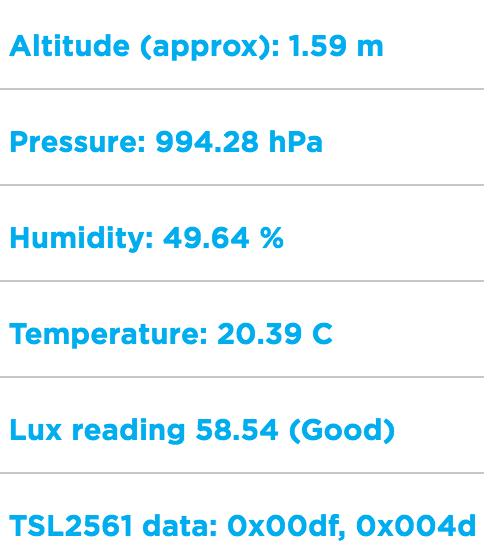 The accuracy of the sensor appears good, pressure and temperature both to 1% and humidity to 3%. Both Sparkfun and Adafruit have provided libraries and example code for the boards. These were easy to add to the development environment. One caveat, the BME280 requires the addition of the Adafruit sensor library as well as the BME280 library. Once added it was a simple case of wiring up the sensor to 3.3V and the I2C bus and running the example code. They both worked first time. The light sensor has been show to work in low light conditions but not to any degree of precision. A possible modification to the example code is to look at the sensitivity and integration window settings to see if the precision can be adjusted to make the sensor return better readings in low light. Some of the values when calculated use the fractional part of a floating-point number, temperature and humidity spring to mind. This meant adding a method to convert a double into it’s string representation for debugging purposes. Trivially solved but an annoying omission from the implementation of sprintf. Two simple to use sensors with good supported class libraries make these sensors quick and easy to hook up to the Oak. 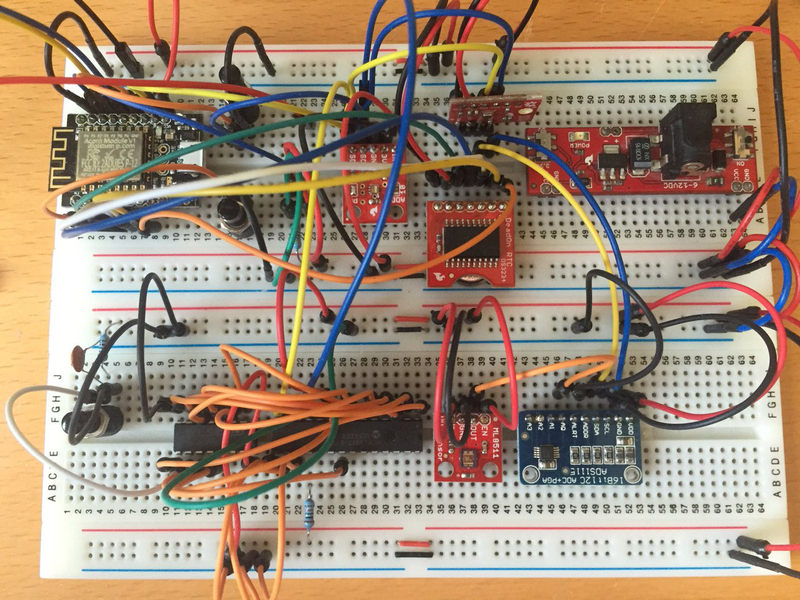 Merging the two examples was simple and sensor data is now appearing over the serial output from the Arduino. Compiling the code gives some warnings about the I2C library being compiled for the ESP8266 whilst the target board is defined as an Oak. 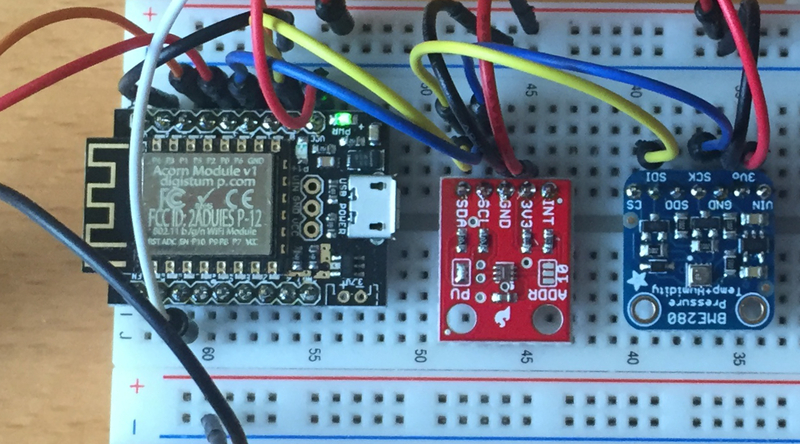 This can be ignored as the Oak is really a convenient wrapper around an ESP8266 module. Next up, some analog sensors to measure ultraviolet light and wind and rain properties. The Oak microcontroller is new, Digistump only shipped version 1 firmware a few days ago (20th Match 2016). The hardware I have was shipped sometime in January. So the first thing to do is to upgrade the firmware and then try blinking an LED. The Digistump Wiki contains a number of tutorials and troubleshooting guides. First stop the Connecting Your Oak for the First Time page. This shows how the Oak can be connected to your WiFi network and the firmware updated. I started at the top of the list and slowly worked my way down. In the end the only method that worked for me was the serial update. With the latest version of the firmware installed it is time to test the development environment. What could be simpler than flashing and LED. The on board LED is connected to pin 1 so lets try and use that. At the time of writing there was a known issue with the Particle development environment which prevented an application being built and flashed successfully. This is an early release and so issues are expected. This only leaves the Arduino environment, an IDE I really hate. Despite the earlier problems with the firmware update I decided to try the OTA method first. DigitStump have provided compehensive instructions in their WiKi on how to achieve this. Following the example was easy and after only 15 minutes I have the LED on the Oak flashing at 1Hz. Just to prove it was not a fluke I then tried changing the frequency and reflashing the Oak. My initial frustration with the firmware update was soon forgotten once I had an application successfully running on the Oak. I am hoping that the issues were caused by the fact I have an early release of the board with the original firmware installed. Programming is easy enough and can be done over the air which is convenient. Next up, talking to sensors.